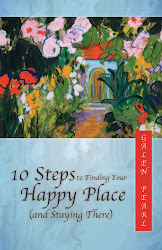 10 Steps to Finding Your Happy Place (and Staying There): Who Would You Meet? A hard choice, but I'll go with the man under the header of my blog- Richard M. Nixon. Interesting! Can you share the reasons for your choice? Politically we're the most alike. Tilting at windmill-wise, he got a HUGE bum rap because of the leftist media. Having read his books I know him for the highly intelligent man he was. It would be interesting to compare our feet of clay. History has a way of evening out the good and the bad. Thanks for the additional comment. I have to say Louis L'Amour, the man has for me the best answer to most any question in life. Simply put, with always the best and kindest in heart. Karen, I'm so glad I asked this question. I'm learning a lot of interesting things from the answers. It's so funny, I found myself thinking about this question. I'm coming up with so many others that I just wish I could have a coffee date with. Like Henry Miller. That man was quite the writer, but so many of quotes, even the odd, off the wall quotes are just amazing, and they come in so useful with everyday happenings! I agree, I could think of many others I would like to meet, too! Great article! I have always been interested in the sins and demons. I believe that each generation should be responsible for whatever challenges they have to deal with and not pass it down to their children. There is enough difficulties for a person to deal with without being further hindered by the challenges of the previous generation. On a larger scale it would be each generation of human beings cleaning up their own mess so that they can leave being a favourable situation for the generations after them. I guess it is kind of like the handover process when someone leaves a job and passes things over to his or her successor. As you rightly point out, as long as we are able to draw breath, we should fight to protect and for what we believe in. Even if we do not win, we will not make it an easy victory and hopefully take as many demons as we can with us. I remember seeing Dragon by the way, great movie! It is cool that you should write about Bruce Lee since I am going through my Mixed Martial Arts phase again. I always enjoyed watching submission specialists fight haha! Hopefully Megumi Fujii, one of the best female MMA fighters in the world with 25 wins and 1 loss, wins Bellator 69 on 18/05/12. Love that most of her wins came by submissions. As for who I would like to meet, it would be Shao Yong, the Chinese Nostradamus of the Song Dynasty. I would have loved to learn more about the I-Ching from him since he devoted his life and his waking moments to it. Dragon is a great movie--I've seen it several times. Interesting about the MMA fighters. I don't watch that, but maybe I should. Thanks for sharing your choice. This is so interesting - thank you! I knew nothing about Bruce Lee, apart from the fact that he made martial arts movies. I would like to see that movie. As for who would I like to meet? Too hard - there are several but I couldn't pick one. Alexia, You would love the movie. It's a great story whether you like martial arts or not. I'm not going let you off the hook--tell us about just one on your list! Well... it seems very presumptuous - but I would certainly like to have met the Buddha. There is no aspiration too presumptuous in this discussion! Thanks for answering. I'm enjoying everyone's ideas! Fun topic! It's cool how you applied what you learned from Bruce to your own life. I have noticed that as I clear my own issues they disappear from the lives of my children. It's nearly scary how magically this happens! Lori, I have heard about quantum jumping and watched a video about it. Great concept that opens up many possibilities! I wonder if the person in the video was DeMello. I can't remember. Thanks for commenting. So who would you meet?? Kara, No kidding. She was a fascinating person. Thanks for commenting. I never had any idea that Bruce Lee had so much more to him. I've never watched any of his movies but I'm putting the dragon in my Netflix queue today! It sounds very inspiring! Betsy, Let me know what you think about the movie. Jason Scott Lee plays Bruce Lee (no relation) and does an excellent job. Lauren Holly plays his wife, Linda Lee. The movie certainly includes the martial arts aspect, but it is really about his life. I can't wait to hear what you think. Be sure to let me know! Thanks for commenting. What a great question Galen. I don't know much about Bruce Lee. I had read that he was deeply spiritual and seen quotes of his in places here and there. This is fascinating. Hmm, I shall have to think who I would like to meet too! Angela, He was very influenced by the Tao Te Ching, at least it seems that way from what he wrote and said. I hope you will come back and tell us who you would like to meet! Thanks for commenting. I would love to meet Karen Armstrong and Audrey Hepburn. I am intrigued by Karen Armstrong's religious transformation - from Catholic nun to religious liberal - and I am inspired by Audrey Hepburn's classic grace and beauty. As for the projections that we put on our children, this is so, so true. I just love the song "Mother" by Pink Floyd for its beautiful lyrics and harsh reality. "Mama's gonna put all her fears into you//Mama's gonna keep you right here under her wing//She won't let you fly, but she might let you sing//Mama's gonna keep baby cozy and warm." We don't place our fears in our children with bad intentions, but with the best protections to protect, nurture and love. We want to keep our children safe, but we don't realize that they absorb everything - absolutely everything - that they see, hear and observe. Christie, Two interesting choices. I am not familiar with that song, but the lyrics are chilling. Thanks for commenting. Nikky, Mother Theresa modeled the verse from the Bible where Jesus says, "When you do this for the least of these, you do it for me." Thanks for your comment. Always a good choice! Thanks for commenting. How interesting that I’ve seen your pic on Harleen’s blog and for some reasons wanted to check you out. Now I know why. The law of attraction being a great part of my life, I think I wanted to click on your link because I just wrote a blog post talking about something very similar to what you are saying about things “demons” transmitted from parent to children. This is true, indeed. My grand-mother transmitted demons to my mother and my mother to me. I do not have children, but if I did I know that because of my knowledge of the mind and the subconscious mind I would have done my best NOT to do the same, but as we know this is easier said than done. Sylviane, Welcome and thanks for stopping by. I will visit back and look forward to reading your post. True about easier said than done, but once we see the pattern, it's a big first step to changing it. PS--I don't see a link to your blog. Will you send me one please? Hi Galen, I'm delighted to connect with you. I've seen your name about the blogosphere and always loved your comments on other blogs but somehow we never got connected. I only blogged for less than a year and then stopped about a year ago...but I'm just about ready to relaunch under a different blog name. I loved this article and know exactly what you mean about passing our demons on to our children. But here's the thing...I discovered recently that one of the fears that was passed on to me from my mother, and which I had thought I had dealt with,had showed up in my daughter...only in a different guise. This made me realise that sometimes we may think that we have dealt with a demon when, in fact,it may still be lurking in our subconscious...and even hidden there, and maybe even particularly because they're hidden there...our children will pick up on them. Does that make sense to you? Anyway, the person I would love to have met has to be Alan Alda in the part of Hawkeye, and indeed the whole crew in M.A.S.H. I've never watched T.V. much but I used to watch M.A.S.H. faithfully every week,many years ago because I loved the way they all interacted with each other. There was something very 'sacred' to me in that programme...I think it was the way they so often dealt with tragic situations but they were always able to lighten those sad moments with laughter. I think it hit a deep and rare note that highlighted what it means to be human and to care for each other. Rosemary, Welcome! Thanks so much for stopping by. Be sure to send me the link to your new blog please. You are very right about the way that the fears can manifest differently in different people and in different generations. Yes, you make perfect sense. As much as I consciously worked to free myself of patterns I didn't want to pass on to my children, I'm sure there still are things I'm unaware of. We all just do our best. Alan Alda--That brings back great memories of that show. I loved it. Thanks for commenting and I look forward to reading your new blog. Don't forget to let me know! I never knew all this about Bruce Lee and so enjoyed your post. I will be the first to admit that demons are passed down from one generation to the next. I know I did some things differently than my mother, but, unfortunately, passed on a few to my daughter before I actually saw them for what they were . . . I would love to meet C. S. Lewis! Martha, Even if we have already passed some issues down to our children, our awareness of it will help us to help them see it and stop it there. Great choice of someone to meet. I read the entire Chronicles of Narnia to my daughter, one chapter every night. I can't remember now how long it took us, but we really enjoyed doing that together. Thanks for your comment. What a fun choice of topic. I also loved the demon metaphor, and I had read the book but not seen the film about Bruce Lee. It might even have been a literary invention of Linda's, which makes it no less valid. She was working through her grief, writing immediately after he died. There are so many great dead writers who I would want to meet like Twain, Dickens, Cervantes and Albert Camus, but the one I would most want to be around is William Shakespeare. No other writer has expressed such a deep understanding of human hearts, motives and behavior from such a limited formal education. It's possible he never went to school at all. What I would give to see his creative process! I could learn a lot. Mikey, Great choice. His writing has been as unmatched as Bruce Lee's martial arts! Thanks for commenting. I really enjoyed reading this post and was greatly enlightened. I look in the mirrow sometimes and realize I am so my mother. She passed away in 2006 and I miss her alot. However, I do catch myself doing many of things that used to irritate me. Thanks for the learning moment! LeAnn, I do that, too! Sometimes when I see my reflection out of the corner of my eye, I see my mom looking back at me. Thanks for your comment. I've watched Enter the Dragon but not 'Dragon'- am putting it in my list of must-see pictures now. I agree with what you say about the demons that are passed down. I can see some of those in my own life and am working on them. Thank God, we have been gifted with the insight to do that. On the person I'd love to meet, Mahatma Gandhi - The Father of Our Nation as he was called. I would love to interact with him and talk to him at great length about his dream for India and our world. Corinne, What an interesting discussion that would be. If you watch Dragon, let me know what you think! One of the scenes with the demon is modeled on the mirror scene from Enter the Dragon. You'll recognize it. Thanks for your comment. Very interesting, I must watch this movie. I definitely agree on the demons living within us we try not to share with the next generation but unfortunately don't master enough to stop them from reaching others. I saw it with my mum. When she realized it happened to her too she started dealing with these demons, never too late to make things better. So many I would like to meet but I think I will say Jesus. He is at the crossroads of the 3 main religions. Marie, No, it's never too late. Jesus would be a fascinating person to meet. What would you ask him? Thanks for commenting. Bruce Lee!! Amazing, AMAZING soul:)!! He'd be on my list for sure! As would Budda, Jesus, John Lennon just to name a few. I have a pretty long list;)!! Daisy, Another Bruce Lee fan! And other interesting choices as well. Wouldn't it be great to sit down with some of them all together? Buddha, Jesus, Lao Tsu, Mohammed, and more. Thanks for your comment. Jimi, Wouldn't the meeting with your dad be wonderful? If you were 9 when he died, I hope you have some good memories that you carry with you. Thank you for commenting. My great grandmother, whose grave I just found last week in Monrovia, California. Divorced in the 1920s, she was the person my mother preferred above all others, as her own mother was a distracted invalid. Passing down the fears: my mother was terrified of death and avoided funerals and cemeteries. I've become a fan of cemeteries - so maybe that one stopped with me. Linda, Thanks for sharing about your mom. I am grateful that my mom was not afraid to die. We were able to have some great conversations in her last months. I also like cemeteries. Very peaceful and full of stories. Thanks for commenting. Very interesting topic and I have had conversations with myself on who would I invite if I had a party - So I would want Robin Williams for he is hilarious and we all need a bit of humor in this all too serious life. I would have Jesus she he is a REBEL and he would welcome the others at the dinner table. Bob Marley for Reggae music - we all have music in our souls and a little bit of dance during food intermission would be wonderful. I then would have Princess Diana for she was such an inspiration and a beautiful spirit. Mother Teresa so I could ask her how it feels to be so selfless. My grandmother for she would sit there and take it all in and SMILE! Great dinner party! Steve Allen used to have this show where he would invite famous people from history to a discussion. It was so brilliant. He wrote the script and mixed people from all ages and cultures. Your party would be like that. Thanks for your comment. I am truly surprised when you said it would be Bruce Lee. I enjoyed reading your explanation on why this is so. It's great to know that watching the movie had impacted you in a profound way. I realized the same thing too. To help my children, I first need to help myself. I am aware that I have affected them with my demons especially when they were young. I am still far from perfect but my hope is to continue with inner work and do the best I can to help them. Evelyn, Recognizing our own demons and patterns and fears is a big first step in stopping the legacy. All any of us can do is our best. Glad I surprised you with Bruce Lee. That means I'm not completely predictable! Thanks for your comment. You are so right about demons that are passed down from one generation to the other, or perhaps there are very clear signs that can be seen in our kids and we can then relate as to where they have come from. Similarly, there are even some bad habits that kids pick up, which either of our parents had, and their parents had too. And there is absolutely NO other way to fight that demon, other than by facing it boldly and taking it out of your life, for the betterment of your kids. Regarding the question asked about whom I would like to meet. I know there are many people in my list, but I would like to first meet my mom whom I lost a few years back to cancer. I want to ask and share so many things with her, which a mother would want to learn from her mother for her kids. I guess when you have a loving mom whom you loose, you miss her more and it's only when she leaves you that you realize her worth. Harleena, With deep love comes deep loss. I am sorry for your loss, but I'm so glad you had a mom who was so wonderful that she is the person you would want to meet. That says a lot about her, and you, too! Thanks for your comment. Yep, just thinking of her makes me think I'd better get going with my life! As for my demons- tough not to pass them on. When I see one I tell her immediately! Janette, I didn't know that story about Mother Teresa and the Pope's car--that was great! I can see why just thinking about her is inspiring. Thanks for your comment. This was an interesting post, its so true, I too am learning to deal with my own issues, so that I do not pass it on to my daughter, I have not seen the movie, and I do not know much about bruce lee. Some of the persons I would like to meet is my mother - as she died in the Intensive Care Unit and I did not have a chance to be by her side. I would have loved to hear her last words, and my elder sister who died when I was only 11 years old - I would love to listen to her and chat with her for a long time. G Angela, I understand what you mean about losing a parent suddenly and not being there. My dad died suddenly of a heart attack. Not long after he died, I dreamed about him. In the dream he died and I got to say goodbye. I'm also sorry about your sister. You were very young when she died, but I hope you have some good memories of her. Thanks so much for your comment. Reading about Bruce Lee brings to my mind my boarding school. I remember watching "Enter the Dragon" and I was so fascinated by Bruce Lee so much so that some time later when someone said they could talk to spirits I joined in the seance in the hope that I would be able to talk to Bruce Lee. Of course that's another story. I haven't watched Dragon but I do believe that we do pass on our demons to our children. Our fears and insecurities invariably trickle down to our children as they have with us from our parents and so on. I am sure my sense of insecurity has somehow rubbed off on my Ron and I am trying hard to be more brave and confident about life, in the hope that Ron does not carry that with him and eventually pass it on to his children. As for meeting someone, I still would love to meet Bruce Lee, now for far more deeper reasons than what it was when I was a kid. That time it was more in terms of a hero who could fight! Rimly, Now you have got my interest! You tried to talk to Bruce Lee in a seance?! What happened? How interesting that he is the person you would like to meet, too. What would you ask him or say to him? Thanks for your comment. I would want to meet Ayn Rand, author of The Fountainhead and Atlas Shrugged. She was a strong, independent woman who was ahead of her time in many ways. While brutally honest (and accurate) in her assessment of humanity, she embraced selfishness as a virtue and deplored ignorance and lack of ambition. She celebrates independence and achievement. Personally, I think a little dose of Ms. Rand goes a long way, and although I'm not sure she possessed a soul,(and never acknowledged a higher power) I still appreciate her teachings and would love to sit and chat a while with her. I think she suffered many, many demons, but they made her "genius" all the more incredible. Interesting choice and I enjoyed your explanation of why you would choose her. You have piqued my interest and I will go back and read more of her writing. Thank you for commenting. I have wanted to meet Gayle King for a while now...her faithfulness as a friend is inspiring to me. Alida, Gayle King is an interesting woman, isn't she? She has managed to take her own path to success while remaining a steadfast friend. Thanks for commenting. How true this is, our parents demons do get passed down however unintentional. This is one of the things that scared me the most about parenting and sent me running into God's arms. Alecia, The thought of what we do unconsciously as parents is a sobering one, isn't it?! I bet you would have an interesting discussion with your favorite authors. Thanks for your comment. Interesting choice! Thanks for your comment. Enjoyed your post. I agree that if does help to take some time to understand what our family demons are so that we don't pass them on to our children. This may sound cliche, but if I could meet anyone, it would be Oprah Winfrey. By watching her shows, she started me thinking about my spiritual side and wanting to put more time and energy into that part of my life. What she has done with her life and her soothing confidence is amazing. Cathy, That doesn't sound cliche at all. Oprah is a cultural phenomenon. I appreciate the way she models trying to be a good steward of her blessings. She strikes me as quite sincere about helping people. Thanks for your comment.